Very few films can be said to have changed the course of cinema – Easy Rider is one of them. This pioneering road movie about two bikers on a journey across America was shot in 1968 - a year of protests and revolution in many countries across the world. It was the first major American film to portray the drugs, motorcycles and counterculture lifestyle of the times and along with ‘The Graduate’ and ‘Bonnie and Clyde’ Easy Rider signaled the death of old Hollywood and the beginning of a new movement in cinema. This movement would flower in a group of filmmakers including Martin Scorsese and Francis Coppola and result in some of the great American films of the 1970s and 80s. Easy Rider was written by Terry Southern – one of the key writers of his generation whose novels included Candy and The Magic Christian and among whose other screenplays are numbered ‘Dr Strangelove’ and ‘Barbarella’. It was produced by Peter Fonda and directed by Dennis Hopper - both of who had strong links to old Hollywood – Fonda being from one of tinsel town’s most famous dynasties and Hopper a bit part actor in such landmark movies as ‘Rebel Without a Cause’. Easy Rider would give Jack Nicholson a scene-stealing turn as a drunken lawyer and set him on the road to lifelong stardom. 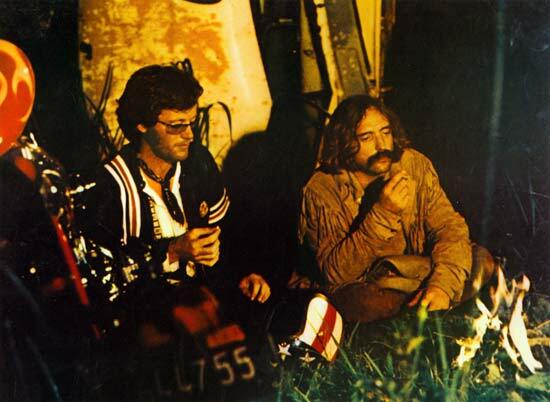 Technically Easy Rider broke new ground –European cinematographer Laszlo Kovacs photographed much of the film using natural light so that it has a naturalistic documentary feel. The picture also used existing rock music in a way that was completely new at the time – editor Donn Cambern chose tracks by Steppenwolf, Jimi Hendrix and The Band from his own record collection - initially as a temporary soundtrack, but they so enhanced the movie that they were retained for the final cut.